Take a surreal trip under the seas in the LEGO® version of the Yellow Submarine from the iconic 1968 animated musical fantasy film inspired by The Beatles. Ideal for display or role-play fun, the Yellow Submarine features loads of cool, authentic details including a cockpit for the included minifigures of John, Paul, George and Ringo. Price is 100% above the initial Lego retail price! This comes down to 19.89 cent per brick. 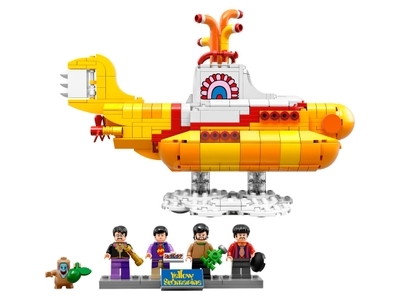 The Yellow Submarine (21306) Lego set is no longer directly available from the sites below. However, 3rd party partners of these sites might still have the set available. Alternate description Let’s all live in a Yellow Submarine with The Beatles! Includes 4 minifigures: John Lennon, Paul McCartney, George Harrison and Ringo Starr, plus a Jeremy figure. Yellow Submarine features a removable top, cockpit that fits all four Beatles minifigures, four rotating periscopes, two rotating propellers and an adjustable rudder, plus a removable display stand. Also includes a minifigure display stand. Accessory elements include John's telescope, Paul's 1x2 ‘Love' tile, Ringo's round 2x2 ‘half a hole' tile, George's submarine motor and Jeremy's apple. Build an authentic replica of the Yellow Submarine in LEGO® bricks. Great for display or role-playing scenes from the iconic 1968 film. Includes a booklet about the LEGO® fan/designer and the Yellow Submarine. Yellow submarine measures over 5” (13cm) high, 9” (25cm) long and 2” (6cm) wide.